Among the many immensely talented software engineers at Zcash Company, Daira Hopwood, engineer and protocol designer, stands apart from the pack as one of the founding members of our team. Ze has been “doing cryptography longer than ze can remember” — inspired by the U.S. government’s attempts to suppress encryption software, such as PGP, in the late 90s. Daira’s primary interest is cryptographic protocol design, which ze finds especially interesting because “you have to think from the point of view of attackers and defenders at the same time.” This is both the challenge and the fascination of the work. Ze is especially drawn to the security and access control side of the craft, which is how ze met other like-minded engineers and researchers early in hir career including Zooko Wilcox, Mark Miller, Alan Karp, Norm Hardy and Charles Landau. They all shared a common belief that the existing models were not adequate because they were difficult to build secure systems on; the models simply were not expressive enough. Zooko was already working on Tahoe-LAFS, a free and open, secure, decentralized, fault-tolerant, distributed data store with a security model that mirrored some elements of what Daira was studying. This and the Least Authority project, a commercial application for the technology, was their next venture leading up to Zcash. “I’m an infrastructure kind of person,” ze says. “People should be allowed to have secrets,” Daira says. Ze is proud of the company’s accomplishments. “We have never had a major cryptographic security bug,” ze says. “We have had a couple of potentially exploitable memory-safety and DoS issues that required security bugfix releases, but never any major design flaw. The creation ze refers to, Zcash protocol, is firmly anchored in the latest technological advances of the network upgrade, Sapling. Wearing hir navy shirt emblazoned with the company’s green and white Sapling logo, Daira is proud of the team’s work (spanning at least two years) on this advancement. Sapling introduced new shielded addresses with significantly improved performance: a time reduction of 90% for constructing transactions and a memory reduction of over 97%. It was very much a team effort, but Daira was responsible for many of the circuit optimizations that allowed these improvements, as well as a substantial part of the cryptographic design to support new features, such as shielded payments using hardware wallets. In hir spare time, Daira is designing a capability-secure programming language called “Noether.” Named after the mathematical physicist Emmy Noether, this language is intended to put into practice what Daira has learned about secure and robust programming, access control, language expressiveness, and type systems. 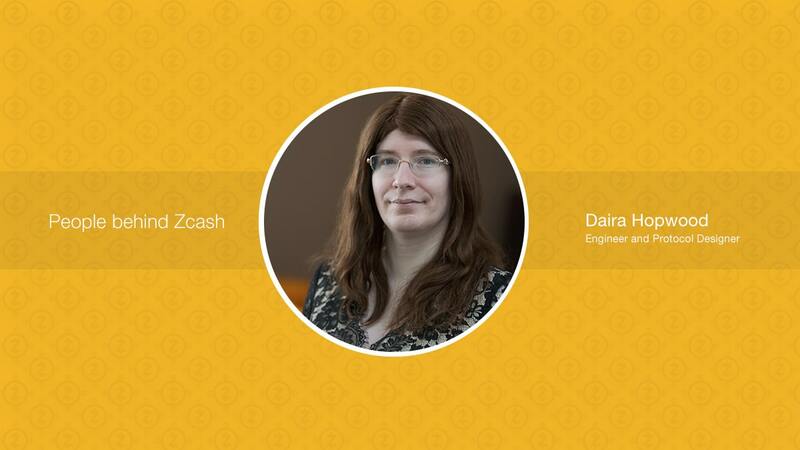 With over 20 years of experience as a software engineer focused on security, and ongoing dedication to Zcash development, Daira is a shining example of the fierce talent responsible for the technological advancements that have been made and already planned for future upgrades.